The visionary R. Buckminster Fuller speaks in 1973 in SUNY Oswego's Hewitt ballroom, at one point in his visit offering $1,000 to any student or faculty member who "designs a practical way to extract energy from the wave power of Lake Ontario." In the same room on March 16, director Sam Green and Indie band Yo La Tengo will present a "live documentary" of Fuller's life and ideas, "The Love Song of R. Buckminster Fuller." OSWEGO — SUNY Oswego will celebrate the late architect, environmentalist, author and inventor R. Buckminster Fuller in March with a series of exhibitions and activities surrounding a “live documentary” of Fuller’s life and ideas directed by Sam Green with music performed onstage by pioneering indie band Yo La Tengo. 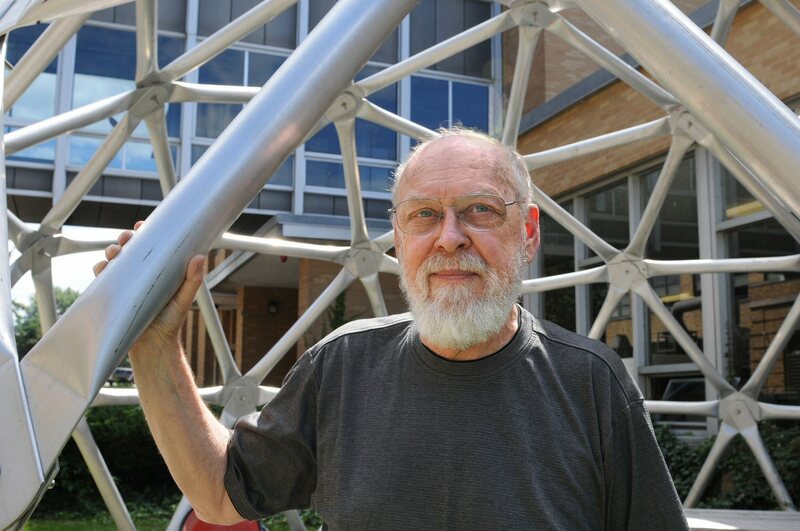 Best known for the geodesic dome, Fuller often — though less widely known — is acknowledged as a father of the modern sustainability movement. Fuller drew an overflow crowd for his talk on campus in 1973, and during his visit offered a $1,000 prize for a workable idea for harnessing the power of Lake Ontario’s waves. 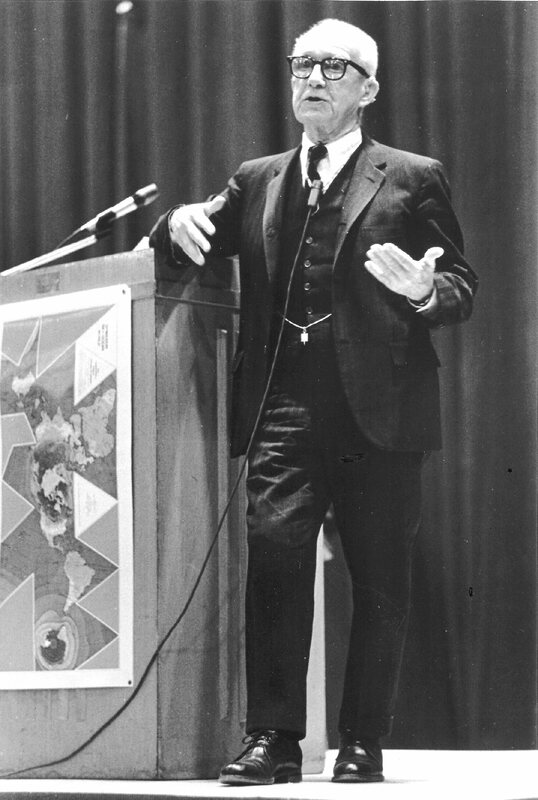 Nearly 43 years later, the college will host Green’s live documentary “The Love Song of R. Buckminster Fuller” on Wednesday, March 16, and present a variety of tributes to the legendary thinker and design scientist. Technology faculty member John Belt, a teacher of design shown in an archive photo with the college’s student-built geodesic dome, says he owes his career at SUNY Oswego to his passion for the ideas of the visionary Buckminster Fuller and to connections he has made through other Fuller devotees. SUNY Oswego technology faculty member and design expert John Belt, whose workspace and office in Park Hall mark him as a longtime Fuller devotee, said he owes his career at Oswego to his passion for the principles of the futurist, a man that Belt said is as relevant today as he was decades ago. Hailed by some as one of the greatest modern minds, the visionary Fuller worked to improve human housing, designing the modular, mass-producible Dymaxion House; inventing the mathematics-based geodesic dome to enclose more interior space without intruding walls or columns; coining the term “spaceship Earth” to describe the integral nature of the globe’s living systems; creating the “World Game” to help humanity better understand, benefit from and more efficiently utilize the world’s resources; and sharing his ideas with audiences around the globe. Belt, who has numerous Fuller artifacts and keeps up correspondence with the inventor’s daughter and many others who honor Fuller’s memory, was thrilled when Shaffer approached him about the appearance of Green, who narrates the futurist’s career in “The Love Song of R. Buckminster Fuller.” Belt has proposed moving the college’s outdoor geodesic dome from near Park Hall to the center of campus for Green’s visit. The Office of Alumni and Parent Relations has put out a call for those among the 1973 audience — in Hewitt ballroom and in front of screens throughout the college’s closed-circuit television system — to share Fuller tales. North Carolina choreographer Ann Dunn, who created a dance piece called “Bucky,” inspired by Fuller’s ideas, has shared the Asheville Ballet’s performance of the work as an additional video element for the celebration and plans to attend. SUNY Oswego students and Tyler Art Gallery will display Fuller-inspired artwork in the Bookville storefront, adjacent to Hewitt ballroom, complementing Fuller artifacts and student-assigned design work provided by Belt. In an ode to Fuller’s trademark structure, members of the Arts Alive student club plan to build a geodesic dome and display it in or around Hewitt ballroom for Green’s appearance, according to club adviser and art department faculty member Ben Entner. Rice Creek Field Station has opened a display, through March 12, of works by geometer and artist James Gyre. Free and open to the public from 9 a.m. to 4:30 p.m. weekdays and 9 a.m. to 3 p.m. Saturdays, “The Nature of Geometry; The Geometry of Nature” will end with a workshop by Gyre starting at 10 a.m. March 12. The session will explore creative uses of 2D and 3D geometry, including secrets of M.C. Escher, Celtic knot work and Islamic art. Green, accompanied by Yo La Tengo, will appear at 7:30 p.m. March 12 in Hewitt ballroom. The live documentary project premiered at the San Francisco Museum of Modern Art and has played at creative venues and festivals from The Kitchen in New York City to the Barbican in London. Green was nominated for an Academy Award in 2004 for “The Weather Underground.” Yo La Tengo is noted for 14 eclectic albums and frequent use of their tracks as instrumental interludes on National Public Radio. General admission tickets are $20 ($5 for SUNY Oswego students) and are available at all SUNY Oswego box offices, online at tickets.oswego.edu and by calling 315-312-2141. Parking is included in the price of a ticket and is available in the employee lot in front of Culkin Hall and in the rear half of the employee/commuter lot behind Hart and Funnelle residence halls.